Chestnuts are a favorite autumn food in Japan. 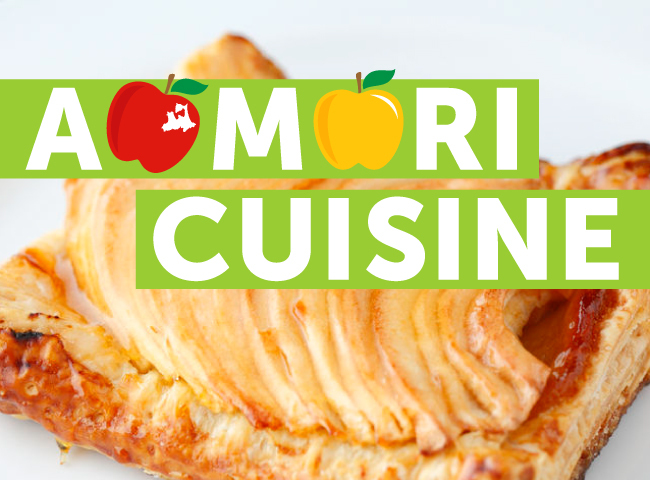 Known as “kuri” in Japanese, they are sometimes is also referred to by the French name of “marron”, particularly when used in Western-style desserts. Chestnuts have been cultivated in the Japan for centuries, with people from as far back as the Jomon period using wood from chestnut trees for their homes. Japanese chestnuts are small-to-medium sized, with a spiny outer hull and a double-layered shell protecting soft yellow flesh. 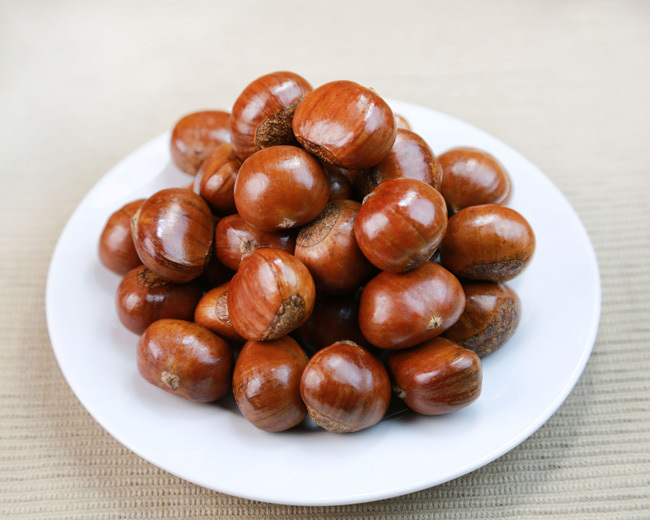 They can be roasted, boiled, steamed, candied, or dried and ground up to make chestnut flour. Chestnuts are used in a variety of dishes that range from savory to sweet, including both traditional Japanese cuisine and Western-style foods. 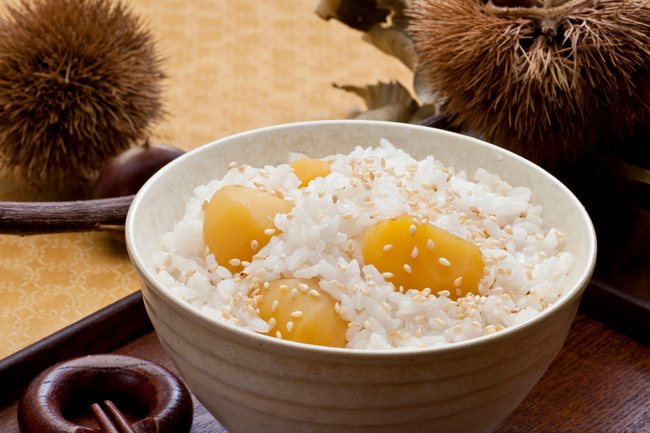 Kurigohan is a dish that combines two important food items harvested in autumn–chestnuts and rice. The two are steamed together with soy sauce, sake, sweet mirin rice wine, a bit of sugar and salt, and kombu kelp. This results in a dish with a magnificently nutty aroma that is a sign for many people that autumn has begun. Chestnut puree is a popular filling for cakes, sweet breads, pastries and traditional wagashi sweets in Japan. 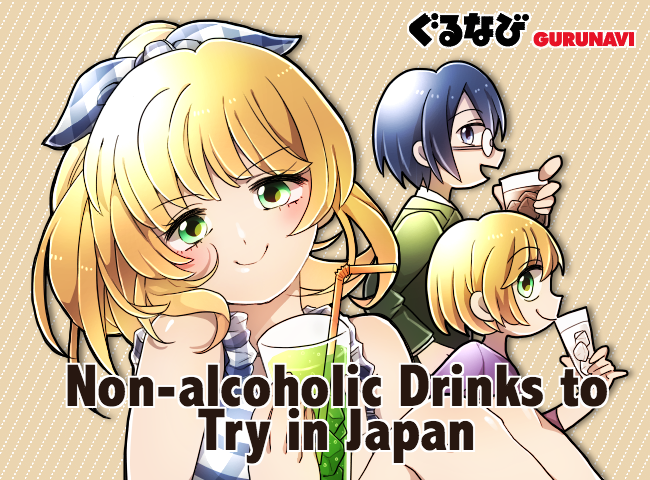 It comes most commonly in two forms, kuri kinton and kuri-an. Kuri kinton, meaning “chestnut gold mash”, is eaten as part of the traditional Japanese new year meal, as it symbolizes wealth and prosperity for the year ahead. Kuri kinton is a mixture of the nuts and syrup from kuri no kanroni (candied chestnuts), satsumaimo (Japanese sweet potatoes), sugar, salt and mirin. Gardenia pods are added to the simmering mixture to enhance the yellow-gold color of the paste. Kuri kinton can be served in a range of ways–scooped into a bowl, shaped into dumplings, as a flavor in cakes or mousses, and covered in a dough of kudzu (Japanese arrowroot) and water. Kuri-an draws on the Japanese sweet red bean paste, anko, and is a puree of chestnuts, mirin, sugar, salt and water. 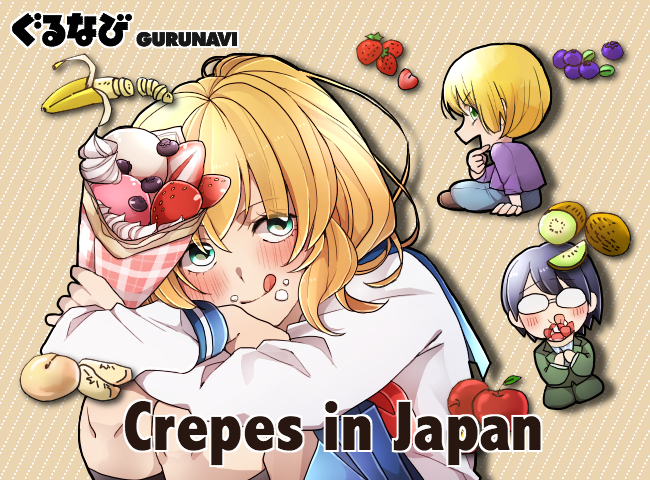 It can be found most commonly inside doraykai, a type of Japanese pancake, and kuri-anpan, a kind of sweet bread roll eaten in Japan. 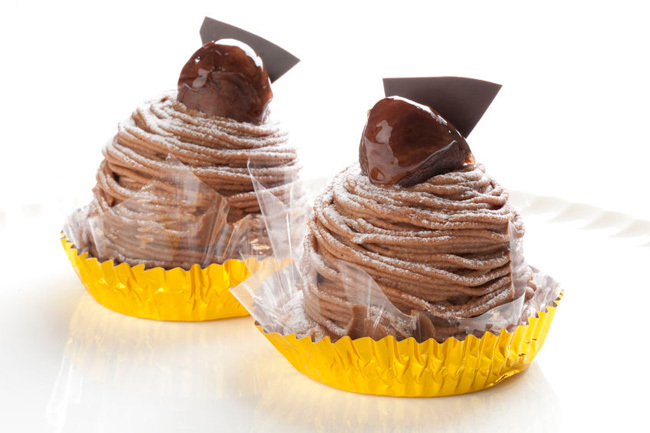 Monburan is a Japanese dessert based on the traditional French dessert of puréed chestnuts topped with whipped cream known as “Mont Blanc”. Japanese monburan is a decadent sponge cake with layers of fresh cream and whipped cream, encased in chestnut purée piped over it in stringy, spaghetti-like layers that give it a distinctive appearance, and then topped with a candied chestnut. 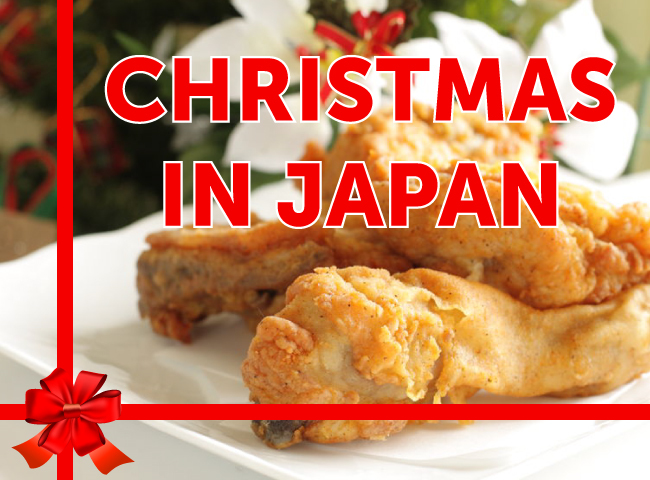 In Japan, roast chestnuts (yaki-guri) are made using a traditional method from China. The chestnuts are added to a large nabe pot filled with tiny pebbles. The nabe is heated so that the pebbles slowly roast the chestnuts to the core. 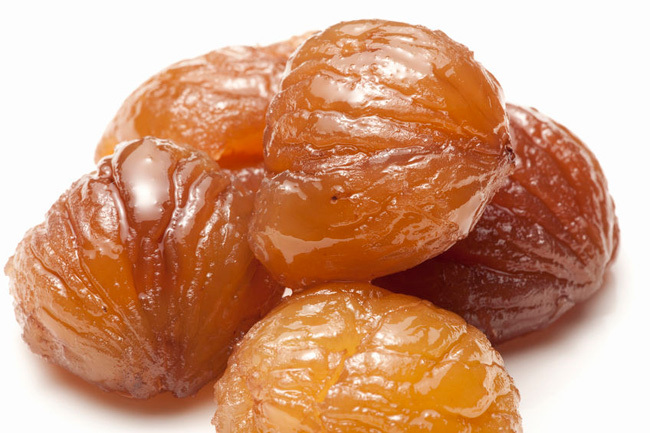 This results in perfectly cooked, fluffy chestnuts that are easy to peel. Yaki-guri are a frequent sight at streetside vendors, and can also be found in many supermarkets during this season. The term mushipan–“mushi” meaning steamed, and “pan” meaning bread or cake–Japanese steamed cakes. 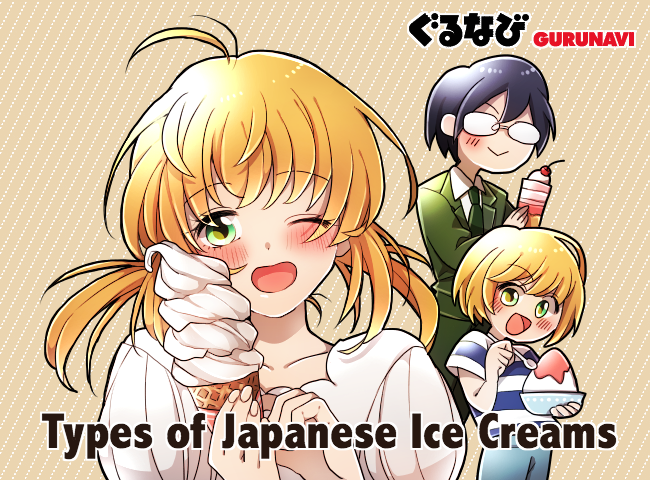 These are a popular type of cake in Japan, particularly because they can be cooked stove-top or in the microwave or rice-cooker rather than an oven, and are also commonly available from convenience stores, supermarkets and bakeries. 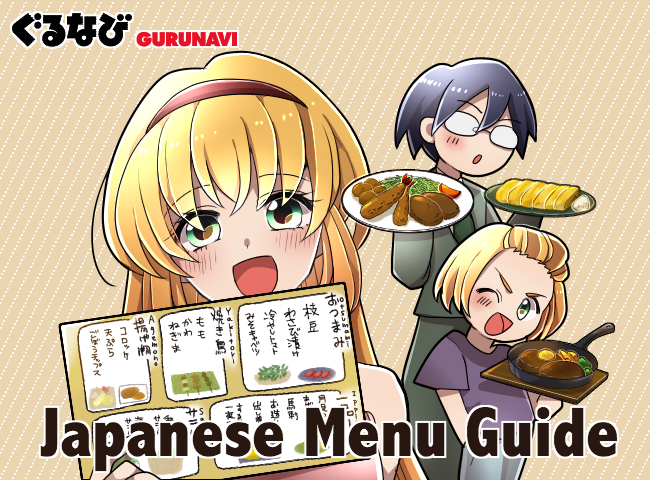 Mushipan come in a wide variety of flavors, and often reflect seasonal ingredients. In autumn, you can find chestnut or mont blanc mushipan, filled with pieces of candied chestnut, or with a mixture of chestnut paste and whipped cream and topped with extra chestnut paste. 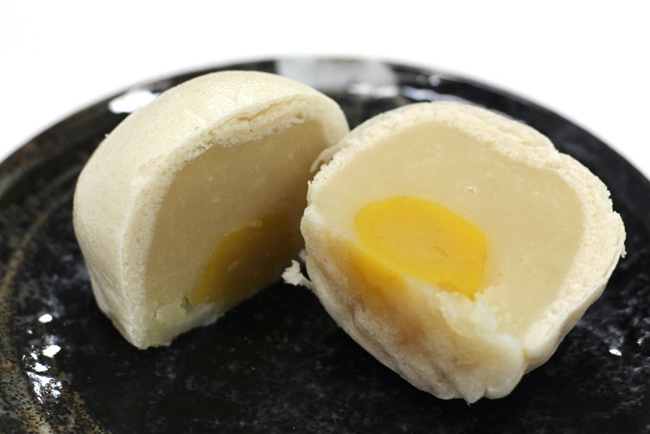 Manju is a wagashi pastry cake filled with sweetened bean paste. 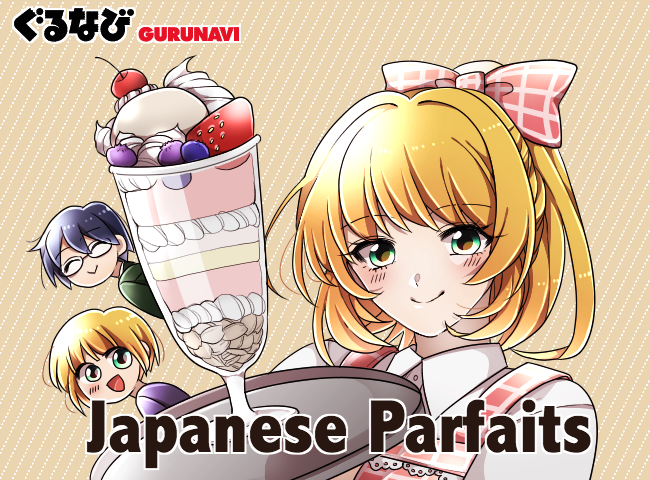 For kuri manju, the cakes can be filled with a whole candied chestnut, sweetened chestnut paste, or a mixture of shiroan (sweet white bean paste) with chunks of chestnut. The manju can be formed into various shapes before baking or steaming, from perfectly round to oval, to a pointed chestnut shape. 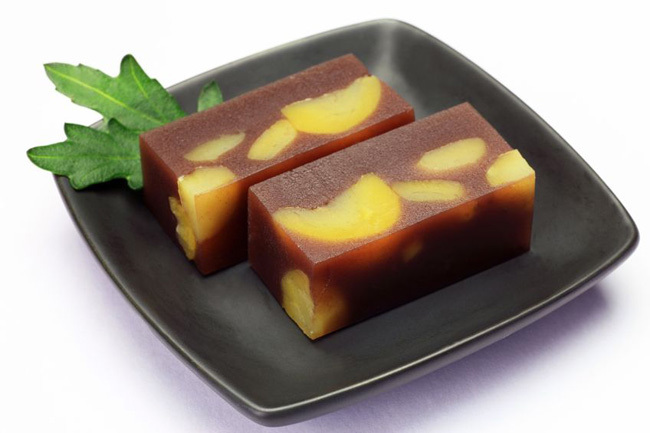 Yokan is a traditional jelly dessert made with sweetened red bean paste molded into blocks. The red bean paste is carefully strained until smooth, then mixed with agar agar, a traditional Japanese coagulant that gives yokan its unique soft texture. 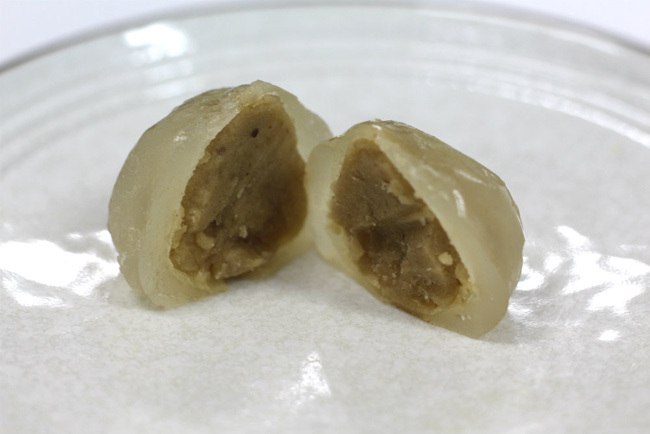 One local variety of yokan, from the Narita area near Tokyo, is kurimushi yokan, which has chunks of steamed chestnuts mixed in with the bean paste. 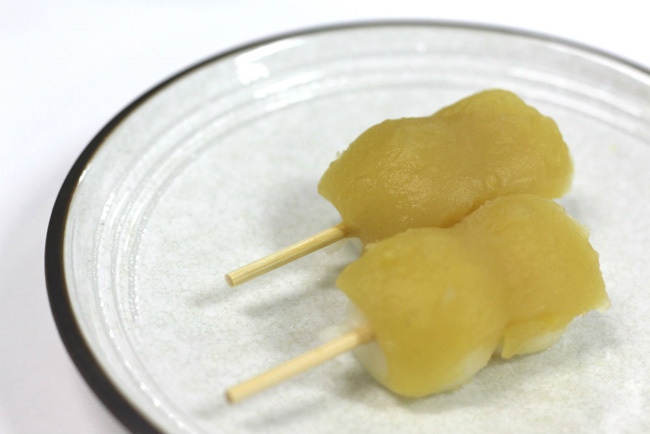 Dango are small, sticky dumplings made from sweet mochiko rice flour. They come in a variety of flavors and are typically boiled and skewered with 3 to 4 pieces together per bamboo skewer, and may also be then grilled over an open flame. In the autumn, the skewered dango are smothered in delicious chestnut paste for a sweet and nutty treat. 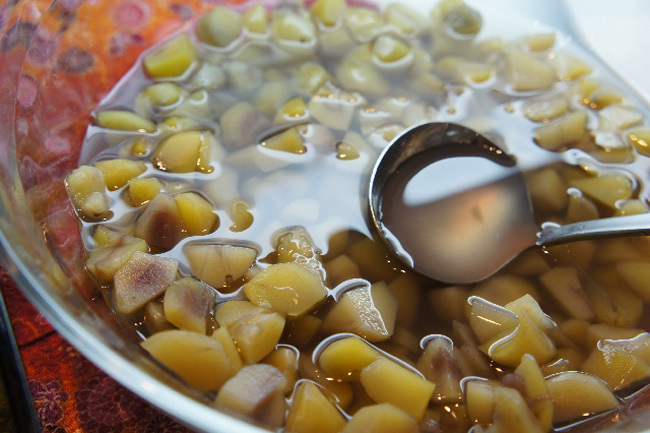 Kuri no kanroni is a candied chestnut compote. It’s made using peeled chestnuts which are boiled until tender and then simmered in a simple sugar syrup in stages. Kuri no kanroni can be eaten on their own during Osechi, the traditional New Year’s meal in Japan, or mixed into savory dishes like kuri-sekihan (chestnut and red bean rice). 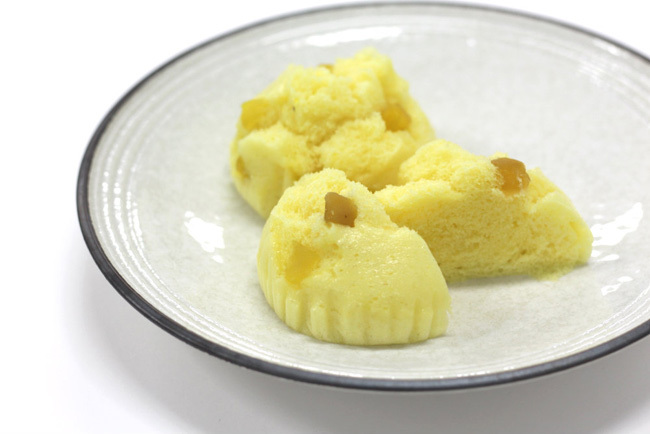 Shibukawani is a traditional Japanese dessert similar to kanroni, but much sweeter. Similar to kanroni, chestnuts cooked in this style takes hours to prepare, but rather than using a fully peeled chestnut as with kanroni, shibukawani is made by peeling away only the first layer of shell, preserving the thin, bitter-tasting inner chestnut skin. The chestnut is then boiled several times to remove all astringency before being candied in syrup. The result is a treat with a natural appearance and incredible flavor, that can be eaten alone or used as an ingredient in other Japanese sweets. 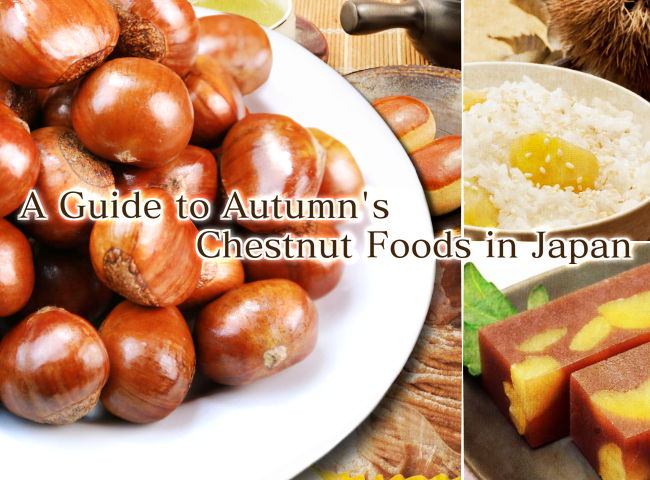 Japan’s love for chestnuts and chestnut food goes back to ancient times. Why not try a traditional chestnut-flavored wagashi sweet or a steaming hot bowl of kurigohan, and fall in love with autumn in Japan?